Kirby's Dream Land review — Kelleher Bros.
Kirby is a well-established character these days, with his own extensive video game series, inclusion in every Super Smash Bros. title, a cartoon from the early 2000’s, and apparently even a long-running manga in Japan. The adorable pink puffball is instantly recognizable and transferable to a seemingly endless list Hello Kitty-style merchandising opportunities. But back when his first game came out, Kirby’s character was still being solidified. When Kirby’s Dream Land was released on Game Boy in 1992, Nintendo of America apparently did not know what color he was supposed be. In Japan, Nintendo had decided Kirby would be pink and used that colorization in box art and advertising from the beginning. In the States, however, Kirby was originally colored white in box art and commercials, as if to match the grayscale graphics of the original Game Boy. 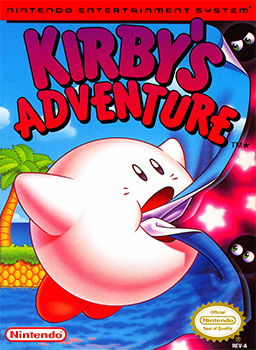 Even when Kirby’s Adventure was released on the NES the following year, Nintendo of America gave our hero a pale pinkish hue, but still rendered him mostly white on the box art once again...for consistency, I guess. Ever the environmentalist, Kirby prepares to kill this tree. The biggest aspect of Kirby tradition not included in his original game was the Copy ability. In Kirby’s Dream Land, our little round protagonist can inhale enemies, then spit them out as a projectile attack or simply swallow them. But choosing the latter does not grant Kirby new abilities, regardless of what enemy he’s eaten. In this first game, Kirby simply eats everything because he can, not because it’s the key to activating his powers of mimicry. As someone playing Kirby’s Dream Land long after the series had really taken off (to say nothing of his Smash Bros. legacy) , the lack of the Copy ability really threw me at first. The eat-an-enemy-take-his-powers mechanic always struck me as Kirby’s defining characteristic. Looking back at it now though, it seems that Kirby’s insatiable hunger for the flesh of sentient creatures is his more distinguishing trait. Copy ability or no, Kirby’s Dream Land is a goddamn delight. The overall presentation is so carefree and effortlessly cheerful, it borders on being overly cutesy and saccharine sweet, yet somehow retaining a unique charm all its own. This is a game where pretty much everything on screen, enemies included, appears friendly and approachable. Even the boss characters look like they were pulled straight out of a heartwarming children’s book. Kirby’s world bounces with a playful vibe that’s genuinely inviting, yet intriguing enough to keep the player engaged from start to finish. Dream Land’s visuals are truly top-notch. Even while constrained to the Game Boy’s four-shade monochromatic screen, developer HAL Laboratory miraculously succeeded in crafting a legitimately vibrant world. Environments in the game’s five levels are impressively varied, from the forested landscapes of the opening level, to a castle, a beach/pirate ship area, and a bouncy white land in the clouds. All sprites are big and clear, with black outlines defining their round edges. Every sprite is also superbly animated, lending the game a lively, buoyant feel. It’s probably worth mentioning here that the director and chief designer of Kirby’s Dream Land was none other than Masahiro Sakurai. These days, Sakurai is best known for his work on Super Smash Bros., an unstoppable juggernaut of the series that he created and has directed every entry of thus far. (He also provides the voice of King Dedede, apparently.) Back in 1992 though, Dream Land was the first game that young Sakurai ever directed, creating an original Nintendo hit franchise on his first try. Not too shabby. As much as the visuals impress, this game’s music is just plain awesome. Composer Jun Ishikawa managed to craft a soundtrack that’s truly fun and memorable, while keeping everything bite-sized small. Each track is bubbly and upbeat, bursting with enthusiasm. The boss battle tunes in particular are rousing good fun, and almost remind me of Zelda: Link’s Awakening. If you haven’t played much Kirby in the past you will still likely recognize many of these tracks from their use in Smash Bros. And they’re so insanely catchy that you’ll be humming them for days. 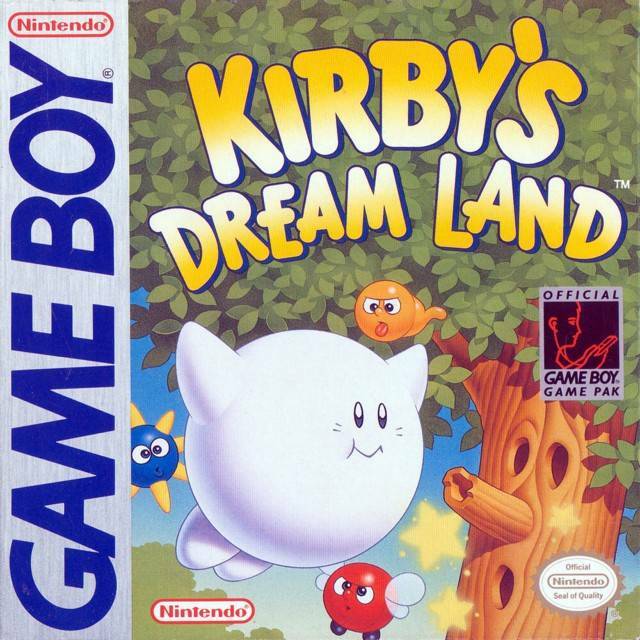 Kirby’s Dream Land is not a particularly long game, with five levels in total: four normal levels and “Mt. Dedede”, a boss-rush finale. From start to finish, the entire game can be completed in about a half hour on the normal difficulty. In fact, when I first sat down to play Dream Land, I easily beat the game on my first try. That might sound too short, but it’s actually a rather ideal size for a handheld game that might be played in short bursts. It also avoids the need for a password or save system. Speaking of difficulty, this game is a breezy stroll; moderately challenging in some places, but not overly hard. It’s certainly engaging enough to keep players interested throughout, but it’s not trying to crush you with an intense gauntlet. At least, it isn’t trying to crush you on Normal mode. If you’re looking for more of a challenge, there’s also a Hard mode for you. After the credits roll, the game tells how to select “Extra Game” mode, aka HARD mode. This version of the game has added more enemies, some completely different enemies (like sprites that weren’t seen in the main game), and far more aggressive attacks from the enemies who were already there. You can choose Extra Game from the get-go by pressing Up, Select, and A at the title screen. Just a warning though, this Hard mode is legitimately tough. Most of the gameplay in Kirby’s Dream Land is really built around Kirby’s inhale. Besides inhaling enemies and objects, our little puffball can also just take in a gulp air and inflate himself like a balloon. While full of air, Kirby has limitless flight, setting the platforming in the game apart from other titles of era. Kirby games certainly aren’t about precision jumps, which feels quite distinct from, say, a Super Mario game. Though if I had to compare Dream Land to a Mario game, Super Mario Bros. 2 (aka Super Mario USA) is definitely the closest analog. The use of doors to transition between areas, as well as the verticality of some levels, is actually quite similar to Super Mario Bros. 2. Also, there’s a creepy floating mask enemy appearing in the second level who bears a striking resemblance to Phanto, the creepy floating mask enemy from Mario 2. Considering these mask guys even behave in almost the exact same way, I’m going to assume they are related. But while Mario’s primary attack is jumping on enemies, using just his own body weight as a weapon, Kirby has no weight at all. (Again, his body is basically a balloon.) Kirby jumping on enemies would surely pose them no harm. Instead, he uses his inflatable ball-body to inhale enemies in and spit them into others. Or, if he’s inhaled only air, he can spit the air back out as small projectile attack. Kirby will also float on the surface of water while inflated…you know, like a beach ball. So it makes perfect sense that the Gordo—these spiky, sea urchin-looking creatures that are virtually indestructible and definitely can not be inhaled—would do the most damage to our pumped-up pink protagonist. I mean, spikes pop balloons. Kirby has a six-segment life bar displayed on the bottom of the screen, which allows him to take multiple hits before he’s done for. When fighting a boss enemy, the opponent’s health will also be displayed just above Kirby’s. In this way, Dream Land almost feels like a Mega Man-esque boss battle game. Get through the level, confront the boss, and take out his health before he does the same to you. 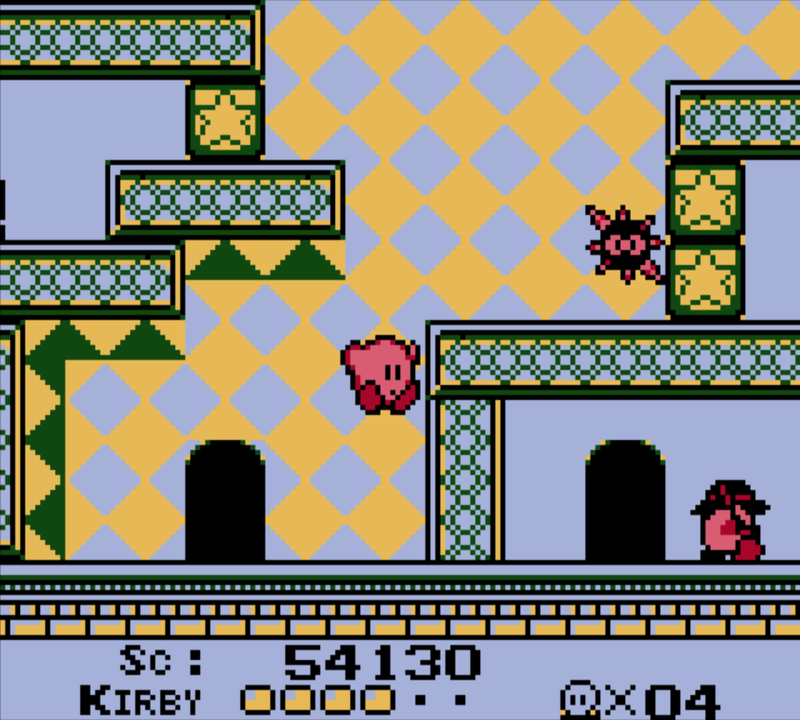 This game also features some arcade-like power-ups to give Kirby temporary new abilities. There’s a sword that Kirby can inhale and spit back out to dispatch all enemies on screen at once, a spicy curry that makes Kirby spit fire for a bit, and a sweet potato that keeps Kirby inflated while he spits out repeated weaponized air puffs. Much like mushrooms and stars in Mario games, these all make perfect, logical sense. There’s a lot to like to like about Kirby’s first outing, but I could see it not being a huge hit with everyone. The game really is short and sweet, which I appreciate, but could have gone for another level or two. Especially with the alternative enemies used in “Extra Game”, it seems that HAL Laboratory put their resources into the bonus mode instead of expanding on the regular game. Many of the enemies in Dream Land are also just a bit too cute and cuddly for my taste, and some of them are just kind of lame. Showdown with the chicken king himself. Take the end boss, King Dedede, for example: I don’t understand the appeal of this character. Is he a chicken, or a duck, or a pelican—he is some kind of bird, right? While definitely a unique design, he strikes me as a fairly stupid villain. Even his name—“Dedede”—sounds dumb. The King’s goofy, cartoonish charm is probably a good litmus test for how much one might enjoy Kirby’s über kid-friendly aesthetic overall. My guess is that the game might simply be too adorable for some players to stomach. Whether it’s too damn cute, or somehow not cute enough, Kirby’s Dream Land is rock solid Game Boy title. The soundtrack and visuals are cheerfully buoyant and vibrant, dispensing the feel-good vibes all day long. The gameplay is downright inspired, giving us a unique platforming adventure the likes of which had never been seen before. And the length of the game, while fairly short, makes for an easy pick-up and play experience on a handheld. But perhaps the greatest strength of this game is in its toned-down difficulty (of normal mode). The no-pressure nature of the lighter difficulty greatly increases the game’s accessibility, making it far more approachable for less experienced players. I think this makes Kirby’s Dream Land—and other Kirby titles, presumably—a great introductory game for newbies and young kids alike.